Holsworthy’s annual Year 9 Belgium Battlefields’ Trip has done it again. Despite the early starts everyone had a thoroughly enjoyable time! The following is a summary of all the sites we went to visit over the English Channel. To arrive there at a reasonable time, we had to set our alarms, get ready and be there for 3:45am! It was a challenge, but somehow everyone managed it. After a very long journey, we reached the euro tunnel by 11:30am and off under the sea! Our first visit was Vimy Ridge which is a Canadian memorial and preserved battlefield site. Before getting a guided tour outside, we spent time in the visitor’s centre, reading and hearing about all sorts of things from a telephone to a razor blade. It was especially interesting as in class, we tend to focus on the English side of the story. It showed us that the life of a soldier wasn’t pleasant. We could actually see, first hand, what they had. Next we were assigned a guide to venture into the supply tunnels. There was around seven of them spread out throughout the site, dug by Welsh miners. These tunnels stretched all the way from the reserve trench to the front line and had a light rail system on it. They were dug by hand, and the bright chalk mined had to be taken back and dumped in the bags used for the sand bags. We also explored the trenches, the Canadian and German front lines were only a matter of metres away! Unexploded bombs scatter the surrounding landscape so sheep are the preferred method of mowing the grass. Next in our adventure, we visited the memorial built on the highest hill around. It is a large, marble masterpiece. Intricate marble statues were carved in the stone, along with the names of the dead around the base. At the back, there was a large garden and a sculpture of mother Canada weeping over an unknown soldier. It depicted the scale of loss and devastation to every country involved. Finally, it was time for bed! We drove in to the nearby town of Albert. After a nice tea out and a visit to the Golden Madonna on Albert Cathedral, somehow left standing after the war, we went to the hostel and got a good night’s sleep ready for our next adventures. We all dragged ourselves out of bed, just in time for breakfast at 7:00am. We were on the bus and soon at our first stop. This was one of the most emotional. It was the Devonshire Cemetery. There was around 160 graves at this particular site. It was small compared to some, but just as hard on us. On a stone by the entrance was an engraving of the post left by our comrades of the war, it read: “the Devonshire held this trench, the Devonshire hold it still”. People buried there were from all over Devon. Some were even from Holsworthy. It was sad, but they died for king and country. We will never forget that. Next we went to the Thiepval Memorial to the Missing. We filled out a worksheet and did our own ceremony to the dead (but more on that later). Thiepval is a memorial to the missing, but also has many English and French graves situated at the back of the site. Seeing the graves together showed, not just the fact they fought side by side, but many lived side by side in the trenches. Just before we left, we had a ceremony where pupils, Chay and Jacca Moran, Katie Grigg and Bradley Vile, with relatives at the site, laid their poems. We also had a minute silence for their memory. “It was very emotional when we first found his name engraved in stone at the Thiepval Memorial to the missing; until you visit for yourself, you don’t realise the actual scale of death on the Somme.” Chay Moran – relative of David Underwood, who is one of those “Missing on the Somme”. After that, we drove to Newfoundland Park (another Canadian battle site). Here we saw the trenches, the caribou of their emblem and the graveyard at the bottom of the site. The caribou is to symbolise a mother calling for its young, which is why it is used at this war site. Then we travelled down to the graveyard to have a look at the graves and their regiments. This was moving to us to see that they fought in these trenches so close to where they were buried. Whilst on our journey to Belgium, we stopped at the Passchendaele museum. In it, we learnt about their dugouts and trenches. We also looked at uniforms, guns and a replica of the houses built after the war for the French and Belgium people left homeless. After that we went to our next hotel in Ypres, called Flanders Lodge, where we started our scrapbooks and then went to bed, for a well-earned rest…! We were initially unable to go to Tynecott Cemetery, with it closed off for a visit by Prince William, who was taking part in New Zealand’s commemorations for their part in the Battle of Passchendaele. We instead went to Essex Farm cemetery, where we learnt about John McRae, who wrote ‘In Flanders Fields’, from which we get the tradition of wearing poppies on Remembrance Day. We saw where he worked as a doctor, attempting to treat battlefield injuries, and also saw Private Strudwick’s grave, who joined the war at the young age of 14, and died 15 years old. We then went to Ypres where we saw the Brooding Soldier memorial and saw the Menin Gate memorial to the missing, for soldiers who served in the Ypres Salient. All before we went and spent a fortune in the chocolate shop! After emptying our wallets and purses, we ate lunch and entered the Cloth Hall, now a museum called Flanders Field museum. We had interactive wrist bands which we could use to explore our assigned characters on top of all the displays and films dotted around the room. One of our favourite displays was where you were walking through no-man’s land. On both sides were guns, barbed wire and mud. It was a new angle that none of us had seen before. Later that day, we went back to Tynecott Cemetery and managed to get in this time. After having a minute’s silence at Devonshire Wall for the Missing, we passed the king of Belgium’s and Prince William’s wreaths, laid earlier that day. Then we boarded the bus, had tea in Ypres and Jaime Ley, Ashleigh Butters and Steve Kerslake, as staff Representative who served time in the army, got changed into school uniform ready for the Menin Gate ceremony. 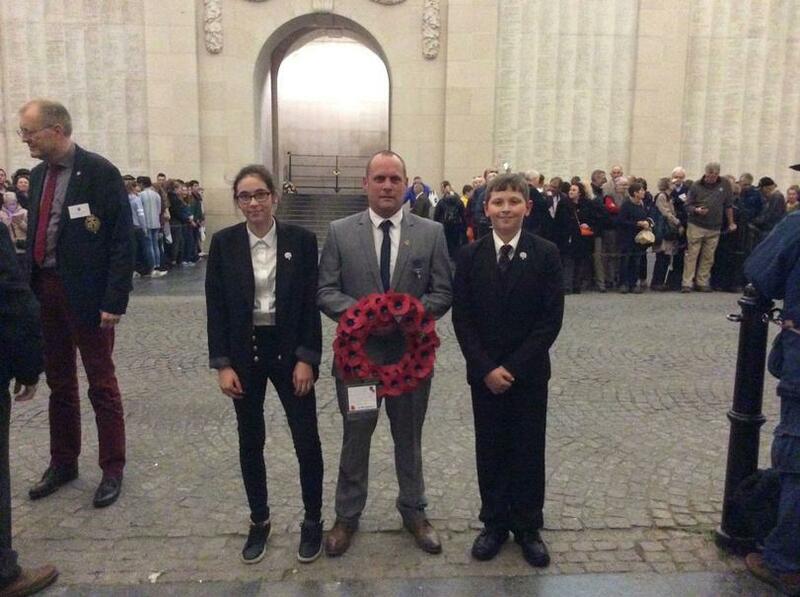 "At Menin Gate we must have waited for nearly an hour, but it was worth it. The buglers, three of them, played the last post on their trumpets. The atmosphere was amazing because of the amount of people who went who probably go every night to pay their respects. Then lots of people laid their wreaths including Jaime, Ashleigh and Steve.” Lewis Andrews. After that, we went to bed, ready for an early waking in the morning for the long trip back home.